At Tarzana Boxing, we aim provide the very best fitness training and workouts in a safe, fun and healthy atmosphere. Our gym combines a focused and complete fighter’s workout with an easy-going neighborhood environment that is accessible to everyone. We offer both group classes and private training. 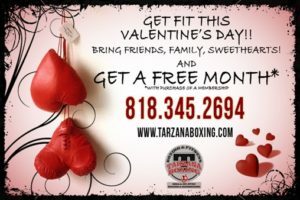 Tarzana Boxing programs include Cardio Workouts, Boxing and Kickboxing, Muay Thai, Brazilian Jiu-Jitsu, Mixed Martial Arts and Personal Training. For our more ambitious students, we offer a specialized Amateur Boxing Team Program for everyone over 9 years old. Tarzana Boxing instructors are all boxers, kickboxers and mixed martial artists that have gone through rigorous training and know the best way to challenge the body to its ultimate shape. Many of our trainers have received awards for their work and have many years of experience which will ensure their ability to help you achieve your fitness goals regardless of your current fitness level. We can even help you understand and meet your nutritional needs. Since 2005, we’ve provided individuals of all ages and fitness levels with a new way to approach personal fitness. Conveniently located on Ventura Boulevard, Tarzana Boxing serves as a hub for boxers from Tarzana, West Hills, Canoga Park, Woodland Hills, Encino, Sherman Oaks, Winnetka, Reseda, Chatsworth and Calabasas. Our classes offer unique opportunities to get in shape and improve your health – and we want to prove it to you with an invitation to stop by and take our free trial fitness class. That’s right, we’re offering you a free workout on us. The Boxing classes at are extremely informative, hands on, fun, upbeat, and open to both men and women, ages 14 and up. There should be no concerns regarding age or fitness level as each individual will train and excel at their own pace. Martial Arts promotes the principle that a smaller, weaker person using leverage and proper technique can successfully defend against a bigger, stronger assailant. Tarzana Boxing has a variety of Martial Arts programs to choose from: MMA, Muay Thai, Jiu Jitsu, Boxing Team. We will be adding Karate and Judo soon. Tarzana Boxing and Fitness offers individual instruction from the industry’s most talented trainers. All of our trainers are professionals and will design a workout custom tailored for you. Individual session and package rates available. At Tarzana Boxing & Fitness our private trainers can customize your fitness goals. Providing First-Rate Workouts and Training.